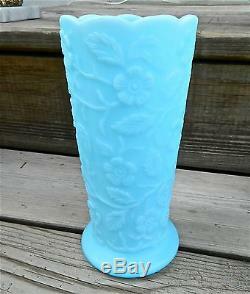 Blue Satin Glass #8257 BA "PEACOCK" Pattern 8 Tall Footed Flower Vase. 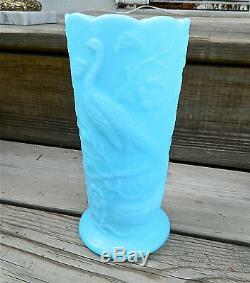 Description: The Vase measures about 8" tall and is 3 5/8" diameter at the top. My photos show the the piece very well, so I won't bore you with a lengthy description. 32 W/other blue satin pieces. 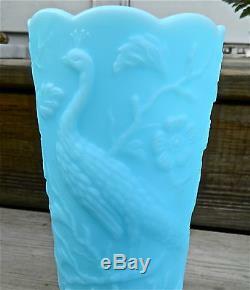 The item "FENTON BLUE SATIN GLASS #8257 BA PEACOCK PATTERN 8 TALL FOOTED VASE" is in sale since Sunday, July 1, 2012. This item is in the category "Pottery & Glass\Glass\Art Glass\North American\Fenton". The seller is "manofglass1" and is located in Strum, Wisconsin.